RepairPro is a library for cell phone and computer repair service with predefined web elements which helps you to build your own site. 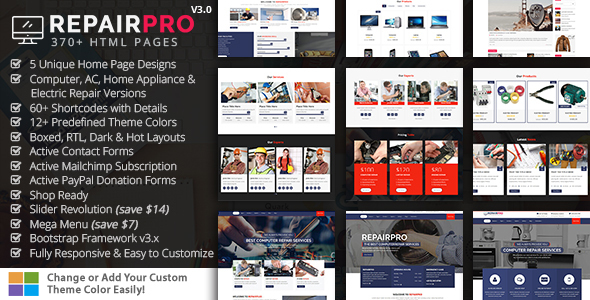 RepairPro Template has a fully responsive layout. It fits perfectly on various displays and resolutions from regular desktop screens to tablets, iPads, iPhones and small mobile devices. RepairPro is suitable for cell phone, computer repair service, desktop computer, Digital Cameras, electronic, glass repair, gsm repair shop, iphone, ipod, laptop repair, locksmith, mobile phone, pc repair, printer, video cameras. RepairPro offers you the best cell phone and computer repair website experience ever, with a super friendly and 100% responsive layouts. - Added: Ac Repair Layouts. - Added: Home Appliace Repair Layouts. - Added: Electric Repair Layouts. - Added: 14 New Home Variations. - Added: 60+ Shortcode Pages. - Modified: Header and Footer Sections. - Added: Google Map with Multi Locations (page-contact5-with-multiple-marker.html) and (page-contact6-with-multiple-marker.html).